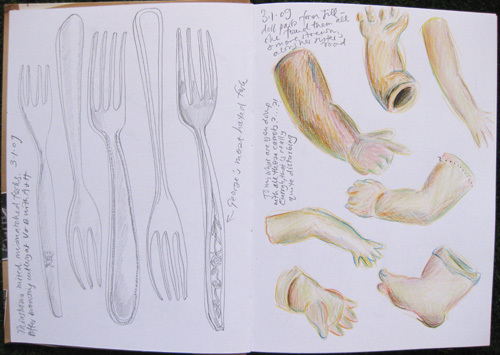 A page from my sketchbook…Jill brought me a new year present of a bag of doll limbs she found strewn all over the road. I’ll definitely make them into something one day. This entry was posted in sketchbook and tagged drawing, sketchbooks on January 4, 2009 by Jane Porter. Ooh, I love the combination of the forks and the doll parts. Wonderfully weird and thought-provoking!